Wanted: People Who Need Money FAST! How YOU can cash in on the $25,000-a-day secret that's made millions. "I strongly recommend this book. It contains keys to success that will guide you past obstacles you thought were insurmountable. I've known Stuart Lichtman a long time, his material gets people results. If you have big goals and you're looking for that one 'missing piece' to help you achieve them, read this book and put its solid ideas to work for you." and "The Power of Focus"
"This is the most important book on making money I've read since 'Think and Grow Rich,' and frankly, it's even more powerful. I say that because I tried just one of the techniques and I was blown away by the results! The month after I put the technique into practice, my income was over four times the size of the previous month's." If someone told you about a new way to bring in a lot of money quickly - and it was legal and easy to do - you'd want to know more about it. How do I know these things about you? This knowledge comes from years of experience with tens of thousands of people around the world. All kinds of people. And every one of them had hidden skills and talents they weren't using nearly as powerfully as they could. What is more, once they knew about a secret (that I will tell you about today), their lives and their fortunes changed for the better - quickly and forever! "The most scientific and reproducible wealth-attracting method I've ever seen. When Stuart tells you 'everything is possible,' he's serious. "Want more money? Thousands? Millions? Get ready; everything IS possible. This book hands you hard-edged certainty in place of all-too-common double-talk and fuzziness. You'll learn exactly how to quantify, measure and achieve even the wildest of goals. Do the techniques exactly as Stuart explains them - you WILL get your millions. "Even better, you'll have fun doing it." There's an easy-to-learn method you can use to take any past success you've ever had (even if it has nothing to do with money), and use it as the springboard to succeed in generating a lot of money for yourself quickly. Even if you've never made a lot of money before, as long as you've been at least somewhat successful in any other way, you can be VERY successful financially. Of course, if you've ever made any real money at any time in your life, then making a lot more (and in a much more comfortable way) will be a piece of cake! Imagine what your life would be like if you mastered that secret! In just a little while, I am going to tell you just how to do that. 8 out of 10 new businesses fail within the first 5 years. In America - the world's wealthiest country, with more opportunities than anywhere else - 95% of people are broke at age 65. Why is that? There are plenty of goal-setting systems and personal achievement "technologies" readily available to help people learn to make money. How come these achievement methods work sometimes, but not most of the time? In this letter, I will tell you the reason... and give you a chance overcome those miserable odds and get exactly what you want. But first, let me give you a little background on the money-making secret. Specifically, how I discovered it, and how I made it work for myself. It all came about almost 40 years ago, when I had an idea for a high-tech business and I needed some money to fund it. $16.5 million* in 2 days - from a complete stranger! I'll admit it - I have a different slant on things than most people. For one thing, when I was a student at the Massachusetts Institute of Technology (MIT), I studied all fields of engineering at the same time - to the amazement (and discomfort) of the more "conventional thinkers" at the school. As I studied engineering (plus psychology and economics), I made some important discoveries about personal achievement and financial success. I discovered things that no one else had ever known before - and most people still don't know. So naturally, later on in my life, I applied some of this unique knowledge when I needed to raise money to fund my high-tech start-up idea. How? I prepared myself mentally for a few hours, and then I called a man who had never heard of me before. Two days later, that man sent his executive vice president on a plane halfway across the country. We signed a one and a half page letter agreement, and to start the company, he gave me a check for $16.5 million*. "Not since Maxwell Maltz released the classic Psycho-Cybernetics, has there been such a remarkable work on the science of mind and the physics of creativity as Stuart Lichtman and Joe Vitale's 'How to Get Lots of Money for Anything Fast.' And truly 'lots of money' is the very least of it. If you are excited to learn a proven positive process for creating anything you want in your life and work, this is Your Book. It is absolutely Brilliant!" Author of the million-selling "The Greatest Networker in the World"
But could this technique work for anyone else? If you're like most people, you probably wonder if the story about the $16.5 million* check is even true (it is - the company was called Recognition Terminals and the investor was based in Dallas, Texas). Then you might say something like this: "OK, let's say it really is true. If I were an MIT graduate who studied six different types of engineering all at once, I suppose I could make millions of dollars materialize out of thin air with nothing more than a phone call, too. But I'm not. I mean, could this technique work for anyone else? Could it work for me?" But you wouldn't be the only person who's ever wondered that. I wondered the same thing, too. For years. And in the 1980s, I set upon a worldwide quest to find out. Test results with others were even more astonishing! I taught my method to Michael Bell, newly-appointed CEO of International Business Communications (IBC), in London. Michael was, to put it politely, in deep trouble. IBC was losing close to $3 million a year. If he wanted to keep his job, he would have to turn things around - and in a hurry. After Michael learned my method, the company's sales and profits skyrocketed. In fact, within three years, IBC went public - and Michael ended up $10 million richer. But I still wasn't satisfied. I had to know: was this just a fluke? Within eight weeks, Mel had a number of top paying clients for his new firm, Melvyn Bernstein Architects. After that, Mel used what he had learned for an even more, seemingly impossible goal - to get his new company's work featured in the prestigious House & Garden magazine. That was followed by a feature on the national cable TV network A&E, on the show House Beautiful. That was encouraging, but I knew further testing was needed before I was sure I had a winner on my hands. That was why I then taught my method to Suzanne Peters, a fine art photographer in Pasadena, California. Suzanne had decided to return to her former career of consulting and training. Using what she learned, Suzanne made a much faster (and more lucrative) transition back to her old profession than most people would think possible. Within 17 days, she had a contract with a major statistical research firm in Rockville, Maryland resulting in fees of $189,000. "I'm speechless! This is the first and only book of its kind! I'm convinced that anyone who buys this book will be able to achieve all their goals and make their dreams come true. "I was skeptical that these life-changing formulas would work for me because I have read similar books in the past that didn't work. Boy, was I surprised! This book clearly explains why I was falling short of my goals in the past. "After I completed just one exercise in this book I felt totally in control of my life! It gets one of my highest recommendations ever!" By now, I realized I really did have a tiger by the tail. Suzanne's success confirmed it. As word got around, many people in the corporate world asked me if I could teach this technique in seminars. I did - to the tune of $25,000 a day. Among the many companies from around the world that hired me: IBM, TRW, Ikea, Digital Equipment, Volvo and Ericsson. I gave the seminars for 15 years, to more than 50,000 people. I kept close tabs on the results. I was especially interested to learn that whole businesses, as well as individuals, could have astounding breakthroughs using my technique. A computer services division of a large international company multiplied sales by eight times in one year. A woman working as a nurse got a job as human resources director - doubling her salary - in three months. A salesman at a publishing company turned around a money-losing product by doubling his sales within nine months. An entrepreneur quadrupled his profits in one year using these techniques. A marketing analyst wanted a job dealing with environmental issues. In less than four weeks, the company created its first environmental affairs department, and made her manager. She jumped up three pay grades. A European engineering manager who wanted to get into venture capital was not only made manager of the company's newly-formed venture capital department, but was also sent to the U.S. for specialized training in this field. He ended up as a partner in a West Coast venture capital firm. What I found from the seminars was, 81% percent of the people who tried my techniques were able to achieve goals they initially considered "seemingly impossible" - in a month or less. Those who didn't achieve these goals, when they followed instructions correctly, achieved their own "seemingly impossible" goals on the second try - at a success rate of almost 100%. However, when I taught my method to entrepreneurs, the "right away" success ratio was much higher - close to 100%. Compare those numbers to the 80% failure rate start-up businesses typically have. You have to wonder: What was different about what I was teaching that made it so strikingly more successful? "Stuart's technique imprinted my goal indelibly on my subconscious mind. I don't think about it, but it's always there. Everything I'm doing is measured by whether or not I'm moving toward or against my goal. If I'm not doing something moving me towards my goal, my subconscious gets me back on course. "This is truly a breakthrough for me personally. I am 100% certain I will achieve a bigger financial goal in a shorter time frame than I would have ever thought possible before I learned this technique. The only negative about this method is, it's so straightforward, some people may actually discount its power!" Co-Author, "33 Days to Online Profits"
What About Ordinary Readers of this Ebook? "Great, Stuart! I'm convinced that when you teach people your technique one-on-one it's very effective. But I still haven't seen any proof . that reading your ebook is going to do anything for me." That's a valid point. In fact, when we first offered this ebook on the Internet some members of my own team voiced the same concern. I knew from my years of research and experience that it would work. But it was readers like you who proved that to be so - beyond the shadow of a doubt. "Before, I was flat broke, working for a software company that was going under...because we had no sales for almost 2 years. I had to accept a 20% cut in pay so they could stay afloat and keep me on board. I support a family of four (and now one on the way), and we're having a hard time getting by on my salary alone. "Then, when I read your book, at first I was unsure if I could use the it to really attract what I wanted effortlessly simply by following your instructions. But I did it anyway. What happened next will not only benefit me, but at least 4 other people who work with me. "I was literally handed two deals totaling $1.1 million dollars. My commission on them will be over $100,000...and that was just the beginning. "To say that I am amazed is just not capturing the true feeling of gratitude and awe that I feel toward the turn around in my opportunities. I have to say that attracting money seems easy now, when before I think I had a cash repellant scaring it all away." "My wife and I rent. We made some mistakes when we were both in college that haven't allowed us to buy our own home quite yet. Right now, we live in an apartment in Oxnard, California. But we've slowly outgrown it. The children are bigger. We need more space. "So it's time to move. Now for those who've been in our shoes before, the biggest problem with moving when you rent is not really moving. It's coming up with a security deposit. And when your credit is as terrible as ours is, the amounts expected for a security deposit are almost excessive. In fact, when a potential landlord asked us for a $8,000 deposit (first and last month's rent plus a $4,000 deposit) I told her that for that kind of money down, I should be buying the house. "To make a long story short. Brandy found the 'perfect' house, with plenty of space for the family AND a front and backyard (which is quite rare in California!). The problem. We needed to come up with a deposit. And we needed to do it in 3 days. "I'll cut to the punch line. Using a technique I learned in Part 2 of Stuart's book, we received $1,800 cash in 18 hours...enough for the deposit AND more. Obviously, I can't and I don't promise that anything like that can happen to anyone else. All I can tell you is that Stuart's technology worked for me and my family. I believe that it's worth a shot for you to at least consider that it could work for you. "Take a look at the book and decide for yourself." "Since I last wrote to you, there has been a multitude of accomplishments and success stories. The latest one was my IRS plan. I figured that I would need about 5k plus my quarterly payments to meet my responsibilities. "At the same time, I had put in a request that my daughter would get a job she has been after for more than two years. I got a call from her on 4/15 that she got hired and was elated. Date she got the job, 4/14." "I downloaded 'How To Get Money for Anything Fast' around October 12th. By the end of the year - using your CT/SA process - I had put a closer to a very challenging 3 1/2 year relationship; found who I believe to be the love of my life and had a 400% increase in business over the same period from the year before! "I thank you for all your outstanding work and how you've helped me to achieve and pull out of a very challenging previous 18 months. " If you'd like to see more testimonials like these, I've put together about fifty of them from the tremendous number I've received, and obtained permission from the people who wrote them, to show them to you. To view the other testimonials, click here. How to get your "Inner Money Machine" in-synch! If you're wondering how my method could possibly be any different from the hundreds of other goal-setting techniques out there, imagine for a second that you're watching and listening to a string quartet playing a beautiful piece of music written by Mozart. In the quartet, you see four musicians: the first violinist, the second violinist, the viola player and the cellist. The music is beautiful because all four musicians are in perfect harmony and playing at precisely the same rhythm. In short, they're all "in synch." Now imagine the same string quartet, but this time, they have a tiny little problem - each musician is reading from a completely different piece of music. So what would they do when it came time to play? They'd all play different melodies. And the chances of their being in harmony: slim to none. What does this have to do with my method for becoming wealthy? It's this. What I discovered in my research is that - for all practical purposes - the brain is actually a "quartet" of four brains; a lot like a string quartet (remember, the real truths in life are very simple). The left brain takes its cues from words and logic. The right brain uses patterns and pictures as its "sheet music." For the mid-brain, emotions call the tune; and the brain stem hears melodies in the form of physical stimulus and response. So, let's say you have a weight problem (nothing personal - many people do) and you "decide" to "go on a diet." What has happened in reality is your left brain made a decision to lose weight. And, if you're lucky, at the same time, you've drawn a picture in your right brain - you have visualized an image of a lighter, slimmer you. But don't count on losing any weight just yet! Because when you sit down to the table to eat... and the mashed potatoes come around... even as your left brain is playing the brand-new "Weight-Loss Concerto" and your right brain is trying hard to keep up - your mid-brain (emotions) is spinning a disk that plays the "same old song": "Do the Mashed Potato!" That is, your mid-brain remembers the good, happy emotions associated with eating delicious, satisfying mashed potatoes. And the physical-action-producing brain stem is playing a song of its own, too - "You've Got That Stuffin' Feelin' ..." as it remembers the pleasurable sensation of mashed potatoes in your mouth... and that nice, familiar feeling of a big, full stomach! You didn't skip the potatoes. You piled them on high and deep. And soon, you're going to ask for seconds! That, in a nutshell, is the problem with most goal-setting programs, whether the goal is to lose weight, to make money, or to achieve anything else. It's why you slip back into old patterns, conditions, and problems. Two or more of the four "instruments" in your brain are "out of synch" with what the "first violin" (left brain) wants them to play - because they didn't get the "sheet music" (goal) that the "first violin" (left brain) wanted each of them to understand. Now stop a minute and pretend that you had an easy-to-use, proven way to translate (or "transpose") the goal ("sheet music") into a format that each part of your brain could understand, all at the same time and in a way that ensured they each paid attention to it. If you had that, THEN you would be able to achieve your goals effortlessly and harmoniously - because the inner conflict you have known for most of you life between the different parts of your brain would suddenly be transformed into synchronized cooperation. And finally, after all these years, you would get what you want - every time! My breakthrough discovery is called Cybernetic Transposition. What it does is to harness the unique, positive creative power of the brain in a way no one else has been able to describe to you - or repeat successfully, over and over - until now. That is why people who apply this technique have experienced successes with a consistency that could not be explained any other way - and why the people who have tried other, less reliable methods, have given up in frustration so often. But Cybernetic Transposition does something even more important than just harmonize the four parts of your brain. It also allows you to enlist the support of all four parts of your brain in remembering earlier successes, and applying the skills, knowledge and enthusiasm involved in achieving those successes to future successes. Imagine being able to do that! In fact, Cybernetic Transposition makes plain (and available to all who want to know) what has until now been the great mystery of how all business creativity occurs. "the goose that laid the golden egg!" I recently teamed up with best-selling author Joe Vitale to put my $25,000-a-day technique into a step-by-step, easy-to understand ebook. Why? In December, 1999, I was driving on a dark stretch of highway in Gaithersburg, Maryland. There was a vehicle stopped on the road ahead, without its lights on, blocking a lane. I didn't see it in time. Fortunately, our car didn't go up in flames. My brush with death could be your ticket to a fortune! When most people have a near-death experience, they end up seeing their lives in a new way. So it was with me. What happened that evening, combined with other events in the world, made me realize I had some important things to do that I'd been putting off for years. I made a decision: take action before it's too late. That was because I realized I had developed the world's most effective and advanced technique for achieving financial goals. I needed to share it with as many people as I could, at a price everyone could afford. And the Internet is the perfect way to do that. "...May be the most important book you've ever read..."
"I never thought there was any real magic in marketing. But I was wrong. 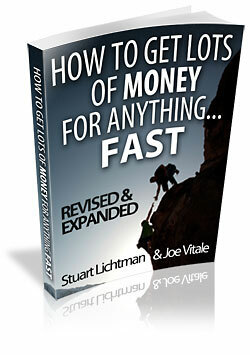 After reading Stuart Lichtman's eye-opening new ebook, 'How to get Lots of Money For Anything You Want - Fast!," I now know there is magic. I know that the name of it is 'Cybernetic Transposition.' And I know that it may be the most important book you've ever read." "In 'How to Get Lots of Money for Anything You Want - Fast,' Stuart Lichtman and Joe Vitale strike at the very core of why most people fail, no matter how hard they try. Those who fail to understand this issue might as well hang up their hopes and go spittin' in the wind. If you have 'doubts' about your ability to succeed, this book will show you what's behind them, and more importantly, how to destroy them." Author, "The Forbidden Keys to Persuasion"
Personal result: a "seven-figure opportunity!" "As an African-American amputee from San Diego who became an Olympic ski medalist, I have been exposed to some of the greatest goal-setting techniques known to man. When I heard about Stuart Lichtman's new method, I was a little cautious. But this is like nothing I have ever seen. "As a result of using this program and eliminating some unconscious blocks I didn't know I had, I have recently been presented with a seven-figure opportunity. Every day new opportunities are flying at me. My biggest problem is how to handle all the new business." Now's YOUR chance to "go for the gold!" It's simply the most powerful, effective information of its type available anywhere. You'll learn exactly what to do, how to do it, and even what to do if you're having trouble with one of the techniques. People have told me that reading this book is like having a master success coach sitting next to you, patiently and kindly guiding you into the upper realms of financial achievement. Take a moment now to think about what you'd like the money for. Make a mental list if you'd like. How much money will you need for what's on your list? Do you know how you're going to get the money? Now you do! Isn't it reassuring to know that all that's standing between you and money is a technique that's been tested, refined and perfected (and proven) with 50,000 people around the world? And you can have this information immediately, by downloading it from the Internet! How much is information like this worth to you? In fact, they typically hired me for six days of training at a time – and would send me a check for $150,000. Of course, if you think about it, a technique you can use anytime you want to create vast sums of money yourself could easily be worth $1,500 to you. That's a small price to pay for the tens or hundreds of thousands of additional dollars you would make with this knowledge. I have already been paid handsomely many, many times for this valuable methodology. Now I want to put it in the hands of as many people as possible. So I'm pricing this one-of-a-kind information at only $129.50 - conservatively, about one-tenth of what it's worth. But to be sure you get this special price, you must act now, because the introductory discount is a test price and may be raised at any time. Fortunately, if you buy today you take no risk. How to Get Lots of Money for Anything - Fast! is backed by a 60-day unconditional money-back guarantee. Use this book to make as much money as you want. If you're not completely satisfied at the end of your sixty-day trial period, simply notify the publisher and you will receive a full and courteous refund. It's really that simple. BONUS #1: Six audio guides that lead you through the six most repeatedly used Super Achievement Processes described in my book. Also included: easy to use, printable forms to help you learn the techniques more quickly. You'll get the same quality and depth of material directly from your computer that corporate students (whose companies paid an average of $4,500 apiece to train) got in their trainings. Also included: easy-to-use, printable forms to help you learn the techniques more quickly. BONUS #2: Proven Secrets for Making Huge Sums of Money in Your Own Business. I have run and consulted to more than 100 successful small businesses, and I've improved the odds for success in each one dramatically. How? By employing the same secrets you'll learn in this 79-page bonus ebook! It contains special information that's rare and practically unknown in the business world at large, but it's yours FREE with your copy of How to Get Lots of Money for Anything - Fast! BONUS #3: How to Cut the Time it Takes You To Do Things in Half, Effortlessly. You'll laugh at cumbersome time-management techniques after you see how simple and effective my time-saving methods are. Little changes you can make easily in your everyday habits can free up tremendous amounts of time. You'll be amazed how well these techniques work! BONUS #4: ZAPPERS! A simple, proven series of techniques you can use at a moment's notice to turn around dicey situations. Ever wish you had a quick fix to diffuse tension at a meeting? When it's time to make a decision, would you like to know how to become clear-headed right away? Want a simple way to become very calm and confident before you have to give a presentation? This special report gives you new techniques you can use immediately to get things working in your favor. BONUS #5: 6 BRAND-NEW PROCESSES to ease your way to using the Cybernetic Transposition technique to achieve (seemingly impossible) goals. BONUS #6: (I saved the best for last): A complete, professionally recorded AudioBook version of the Second Edition of the ebook – every word included. Many people are primarily "audio learners." Even if you’re not, you'll find that HEARING the material, in addition to READING it, will speed up your results. Remember, this package is value-­-priced at only $129.50 (regular price), but you don't have to pay that if you order today. You can get it for only $99.00! Beyond that, please understand that so far you've only seen a glimpse of the tremendous value in this package. Take this opportunity to get the full benefits of this unique information. Keep doing what you've been doing, and you're bound to get the same results. It's a proven fact. And to expect different results while you're doing the same thing is a popular definition of "insanity." But you're not crazy. Maybe you're a little skeptical, though. That's OK. Remember, this method has worked for 10's of thousands of people all over the world. And your nominal investment is fully backed by a 60-day money-back guarantee. So don't risk living a life plagued by perpetual lack of enough money. Give yourself the gift of financial abundance - not just today, but as far into the future as you like. Take the initiative - order today! Of course, you are still protected by our unconditional 60-day money-back guarantee. Get this now before the special price is gone!